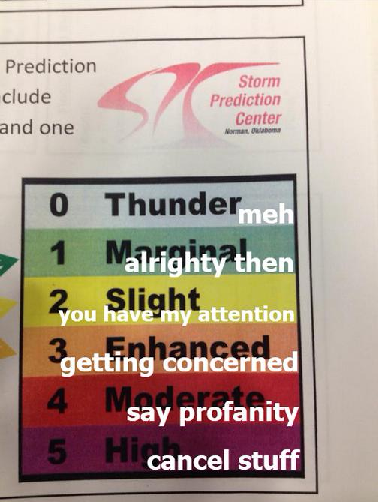 Summary: ENHANCED chance of severe weather tonight and overnight. 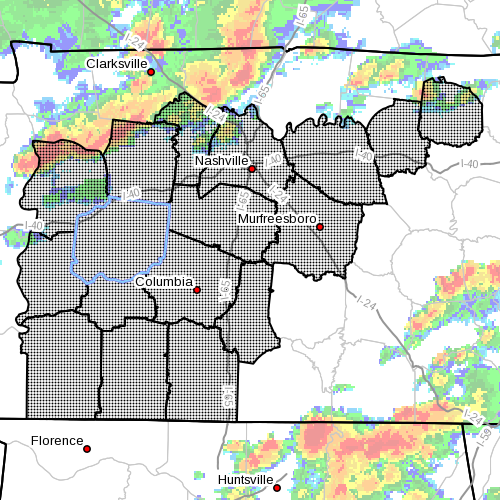 Update 5:15pm 6/26/2015 – We are now in a SEVERE THUNDERSTORM WATCH until 10pm tonight. You can read the official language here. 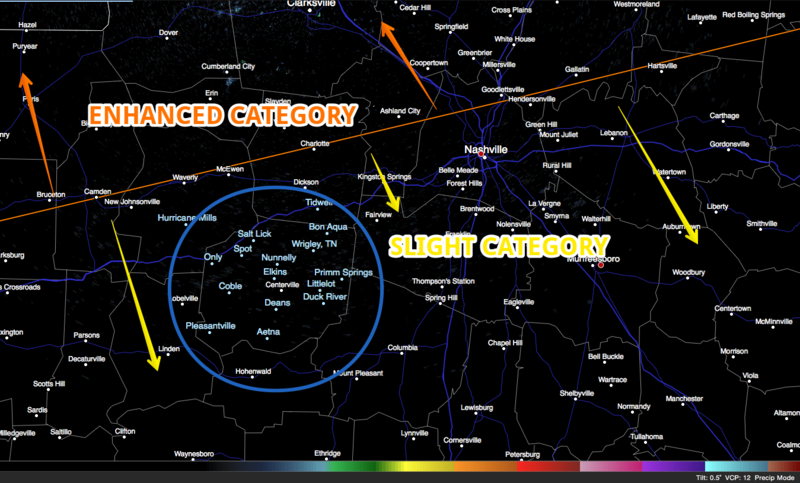 Update 11:45am 6/26/2015 – The SPC has scaled back a bit on the ENHANCED category of severe weather and has Hickman County in the SLIGHT category. They’ve also removed us from the 30% chance of damaging winds and we are now in the 15%. They’ve removed the 2% chance of a tornado and now there is a 0% chance. Today, our high temperature is expected to reach 90 degrees (heat index — or “feels like” temp — will reach about 97 degrees) with a 50% chance of daytime showers and storms. Winds will be out of the west southwest at 5 to 10 mph. Tonight, our rain chances dramatically increase to 80% chance of showers and storms as a cold front moves through Kentucky and drops down into Tennessee. Our overnight low temperature will fall to about 69 degrees. The Storm Prediction Center (SPC) has placed us in the ENHANCED category for severe weather from 7am Friday to 7am Saturday. 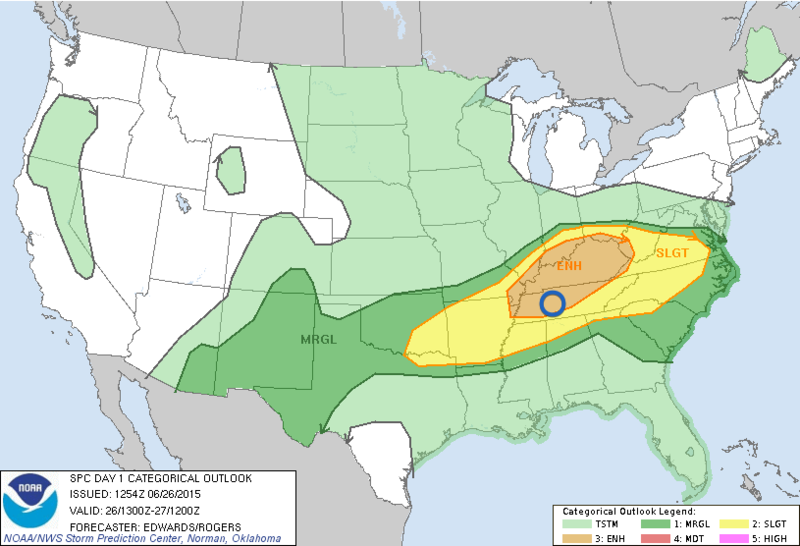 Breaking down the severe weather threat, the SPC has us in a 30% chance of seeing damaging winds 55 mph+ within 25 miles of a point, 15% chance of seeing hail greater than 1 inch diameter within 25 miles of a point, and a 2% chance of seeing a tornado within 25 miles of a point. 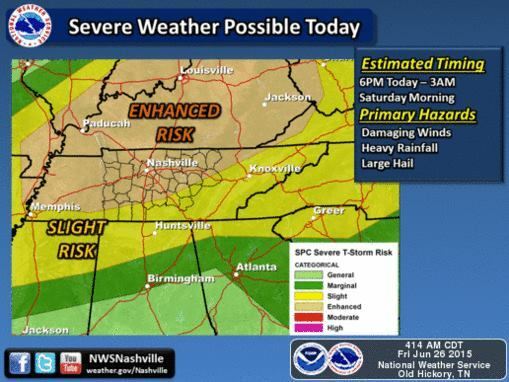 NWSNashville has outlined it well, with our main threats being damaging winds, heavy rainfall, and large hail. Expect lots of lightning as well. A tornado can’t be ruled out, but the likelihood is low. They have the timing at 6pm through 3am, which is on point. 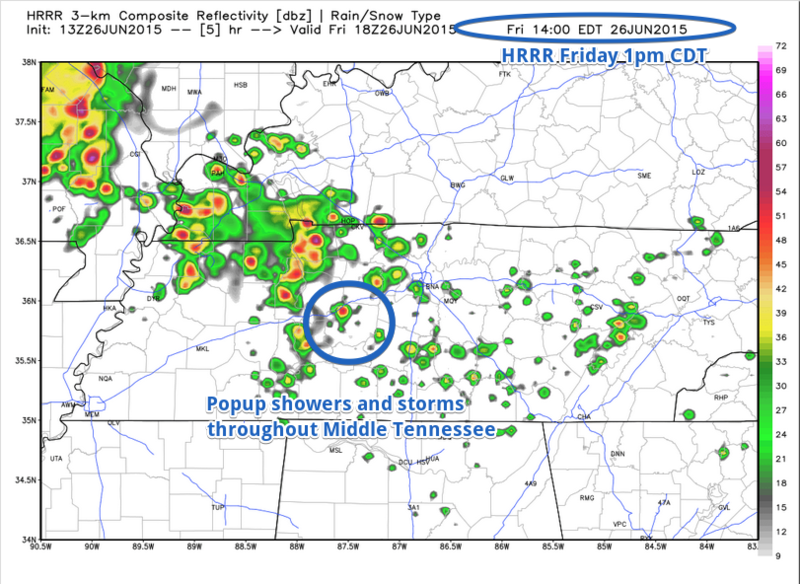 During the daylight hours, we can expect to see some popup showers starting at about 1pm today. 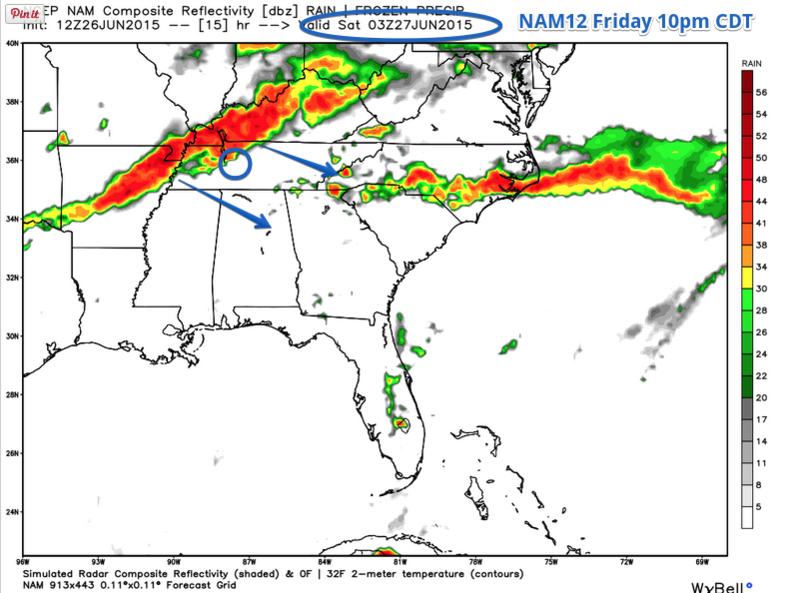 Taking a look at NAM4, it believes the line of showers and storms will reach us at about 9pm tonight. However, NAM12 believes it could be 10pm. So for us, I would say the timing will be around 8pm to Midnight. Either way, it’s going to be a loud and rocky night, one where you want your weather radios close to your bed and stay aware of reliable weather sources. I’ll update the site throughout the day as anything changes/warrants updating. 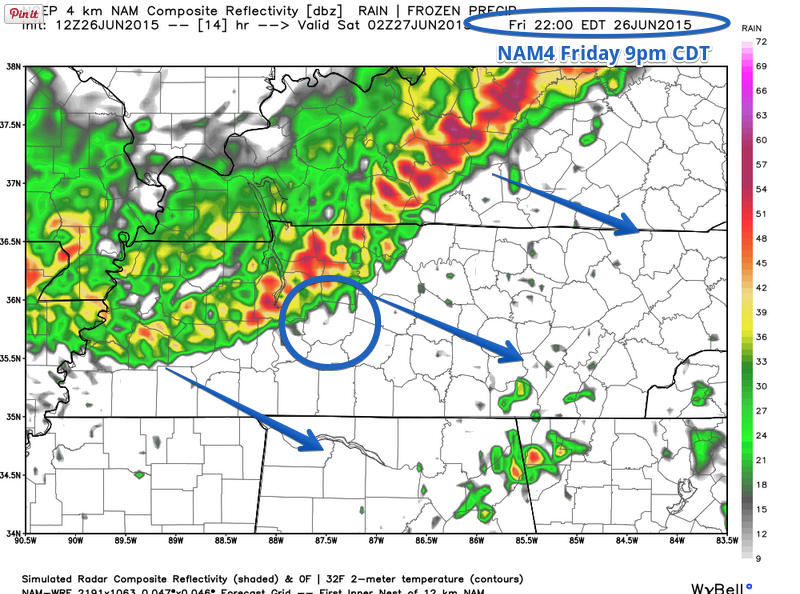 Once the cold front pushes through with the storms, temperatures fall dramatically. Expect temps to drop about 15 degrees. 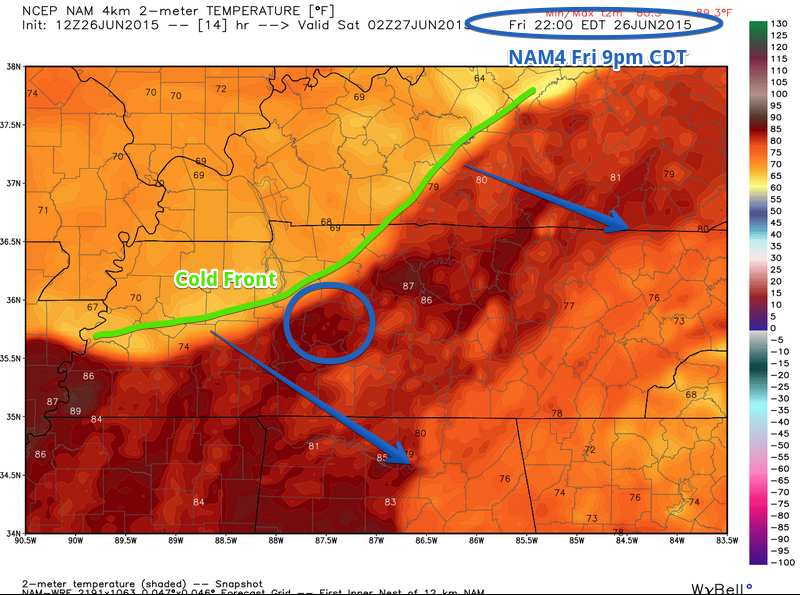 Here’s NAM4’s temperature model, showing a clear cold front that knocks temps from about 87 degrees down to 69 degrees. Overnight, showers continue but start to dissipate. 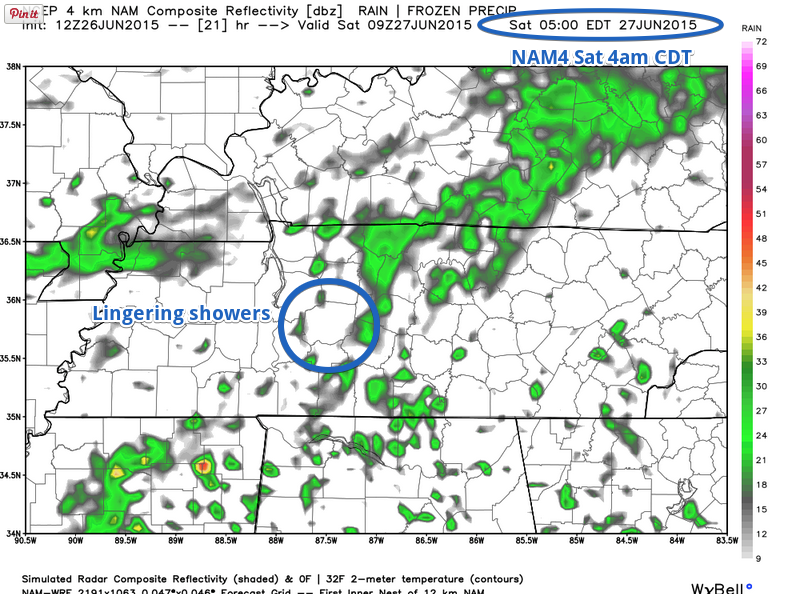 By 4am Saturday, only lingering showers remain. Showers should be out of here my mid morning Saturday morning. 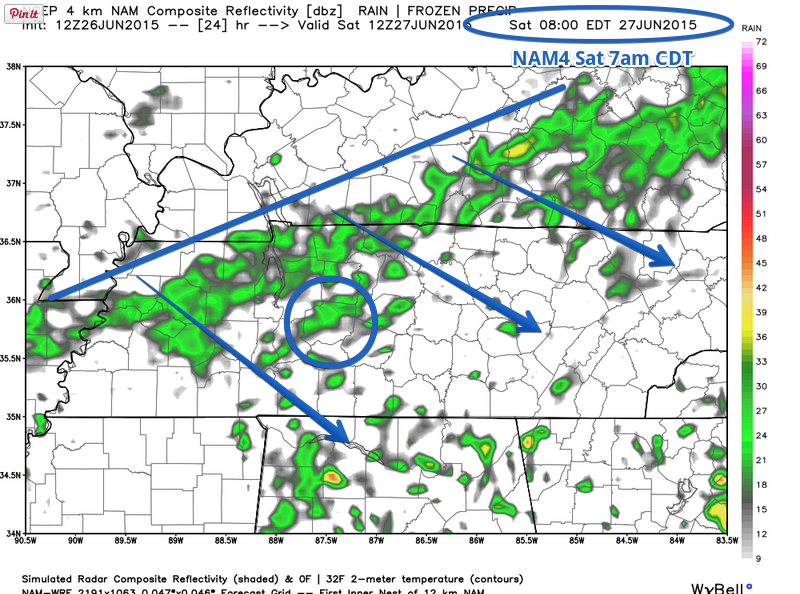 You can see the clearing line pushing showers out in the NAM4 simulated radar below.